In the game of high-stakes limbo that is our local transportation network, a number of truck drivers have learned an important lesson about the hubris of mankind. One moment they're driving happily through the beautiful urban landscape of economic vitality that is downtown Spokane, the next they're clotheslined by a railroad bridge while going under an underpass. Sometimes it wedges them in there. Sometimes it knocks their entire cargo container of the truck, or just totally destroys the truck bed. Either way, along with destroying the truck, it can create huge traffic jams for hours. If it hits a railway bridge, trains have to be stopped and the bridge inspected for damage as well. — April: In a week, three trucks get stuck under the railway bridges in Spokane. — May: A truck gets jammed under the underpass on Stevens street. Two other trucks get stuck under the same railway bridge in the span of two weeks. — July: A semi gets stuck under a Fish Lake Trail Bridge. — August: The bridge at Sprague and Division flat-out knocks a load off a semi-truck. — September: A Waste Management truck gets stuck under the bridge on Stevens and Second. That same month, truck gets stuck under the bridge on Post Street. By September, KHQ reports, there had been 13 trucks hitting bridges in 2016 alone. — October: A Fred's Appliance truck nearly makes it through the underpass on Stevens Street before getting stuck. These even inspired KHQ to put together a Sarah McLachlan-style parody to raise awareness about violence against bridges. As a person who has hit my bicycle helmet on more than my fair share of tree branches, I'm not particularly one to judge the foolishness of these truck drivers. But I did want to figure out if there was a way, rather than spending millions to raise bridges or lower streets, to do a better job of warning drivers of big trucks in that they won't be able to fit under many of Spokane's underpasses. I sat down with Mark Serbousek, director of the Spokane streets department, to try to figure out if there was something — anything — that the city could do to stop the bridge bashers. "We’ve all done stupid things," Serbousek says. "These are big stupid things. That's why [truck drivers] take the test and have to carry an additional license, so they're more aware"
Many of the truck drivers who've hit the bridges, Serbousek says, aren't ignorant out-of-towners. A lot of them are locals. "Which is crazy," Serbousek says, "The excuse we’ve been getting is they didn’t pay attention." Some of that, Serbousek muses, is an increasing tendency to blindly follow wherever the GPS tells them. "It’s really funny, if the GPS says you can go there, a lot of people say you can go there," Serbousek says. Some truck drivers own customized GPS devices that know to avoid low underpasses. But commercial GPS systems, like the type that come with cell phones, don't take this into account, which has had some officials nationwide blaming them for bridge strikes. Unsurprisingly, there are other products that help truckers with this problem, by alerting drivers to low bridges, but not all truckers have them. This is not exactly a Spokane-only phenomenon. There's an entire Wikipedia page dedicated to "11 Foot 8 Bridge," a bridge in Durham, North Carolina that achieved international infamy for scalping trucks too foolish to think they can sneak under. And that's two inches more room than the railway bridge over Stevens, and four inches taller than the bridge on between First and Second Avenues on Wall. Serbousek notes that that, for decades, there have been signs warning drivers of the low heights on the bridges, complete in some cases with yellow flashing lights to make it really clear. But could it be more obvious? What about a sign that stretches up the height of the entire bridge? How about painting a giant mural of a carnival on the side of the Bridge with a YOU MUST BE THIS SHORT TO RIDE THE UNDERPASS sign held by a vacant-eyed clown? Serbousek says there's a limit to what signs can do. "We are reaching a point where we’re saturated by signs," Serbousek says. After a while, drivers, especially those familiar with the area, tend to zone out and ignore many of the signs they see. 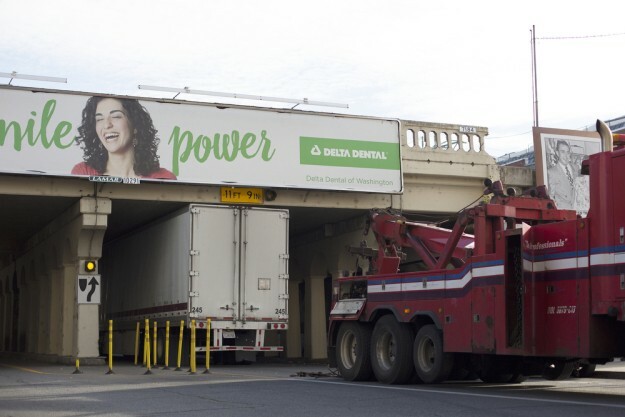 Part of the trouble is that most of the bridges that trucks get stuck under downtown aren't actually owned by the city of Spokane. They're owned by the BNSF railroad. Putting anything directly on the bridge requires the railroad's permission, which in turn requires navigating through the entire corporate bureaucracy. That's not impossible, but it is inconvenient. Even when the city wants to add signals to the railway bridges, Serbousek says, it often prefers to go to the trouble of building separate structures for the lights rather than getting permission to hang it from the bridge itself. It's simpler. No, this isn't a filthy euphemism. Think of the pole sticking out before you try to go up the ramp to the Northtown parking garage. If you're too tall, you hit it, you hear a loud noise, and you feel pretty stupid. But then you back up, and there's no damage done to either the parking garage or your vehicle, other than, perhaps, some scratched paint and some wounded pride. The trouble with this idea, Serbousek says, is that for this sort of thing to work well, you typically need to give trucks to have enough time to stop or turn around before they get that far. But since the blocks in downtown Spokane are so close together, that creates a dilemma. Option 1: You put the pole up the street, while the trucks still have options to turn down other streets. "Now we have trucks that aren’t going that direction, and they can’t go underneath the bang pole," Serbousek says. Option 2: You put the pole closer to the bridge. But that might not be enough warning. "Is it going to stop them?" Serbousek says. "Some of these guys are getting halfway through the bridge before they stop." Not only that, but that won't do much to avoid traffic jams created by a truck needing to slowly back up in the middle of busy intersection. Sure, it's better than a truck getting wedged underneath a bridge for hours, but it's still not ideal. Think of a bang pole, but far more permanent and imposing. Serbousek says that some bridges put a big metal beam at the height of the bridge to physically stop trucks from bashing into it when trying to enter an underpass. He says this tends to do a better job, however, of protecting the bridge rather than protecting the truck itself. Sometimes, there's good reason to do everything necessary to protect bridges: An oversized truck literally destroyed a bridge in Skagit County in 2013, sending three vehicles into the river, and damaging two others, while also shutting down the busy I-5. But the bridges being hit in Spokane are already pretty impenetrable, Serbousek says. "Railroad bridges are typically well over designed," he says. When truck hits railroad bridges, it's the truck that loses. The I-beam would likely still heavily damage the truck and still cause a traffic jam, doing little to solve the underlying problem. Here's an example from Canada. Infrared sensors detect when trucks are too high to pass through a bridge, and then automatically flash to warn drivers of tall trucks to stop, turn around, direct them to take a detour. This solution could run into the same issue as the bang poles or I-beam, confounding truck drivers who never planned to drive under the bridge, but are now confounded by deceptive signaling. And if the drivers aren't noticing the signs, who says they're not just going to ignore the flashing lights as well? The other obvious downside is the cost. A New York study of bridge strikes by trucks identified that a lot of places have found these sort of detection systems to be effective. But they come with a hefty price tag. The cost of installing laser-based over-height detection systems at all identified locations may be very high, considering that the installed cost of these systems at a particular location may be up to $10,000 or higher. Hence, mitigation measures need to be regulatory (e.g., enforcement), technological (e.g., prohibiting the usage of consumer GPS by truck drivers) and educational (e.g., continuing education course related to bridge strikes). And that, ultimately, is something to weigh. Do you spend taxpayer money to try to save truck drivers who are just plain not paying attention? With any solution, the costs have to pitted against the benefits. "We have to look at are they really viable in the situation we have? Can we make them work? How much do they cost? Can we afford something like that? We look at that. Is there money, maybe grants, where we can get something like that?" Serbousek says. "Is there community support for something like that?" Why is WSU's student conduct process now being scrutinized for suspending a football player?